With the introduction of Hand-E, the Robotiq family of Adaptive Grippers has grown. - Allied Automation, Inc.
With the introduction of Hand-E, the Robotiq family of Adaptive Grippers has grown. 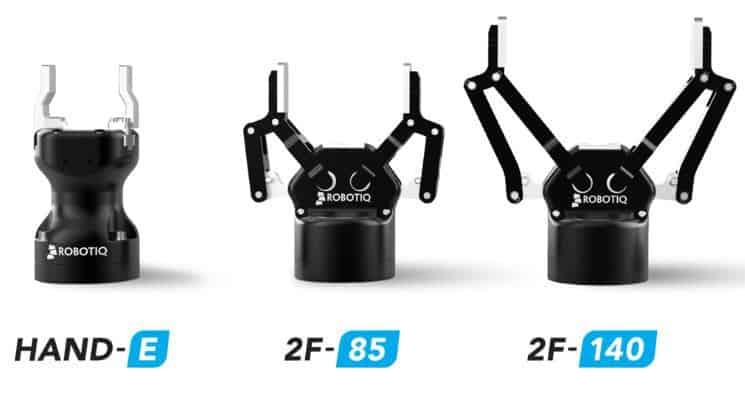 Robotiq’s Adaptive Grippers are ready to use with the new Universal Robots e-Series. So whether you choose the 2F-85, 2F-140, or Hand-E, your gripper will connect directly to the UR e-Series wrist and operate with the same intuitive programming software. You will have full control over the gripper’s position, force, and speed. And since the grippers connect at the wrist, you can say goodbye to long cables—and start production faster. Hand-E is a sealed electric gripper with a 50 mm parallel stroke. With its compact design and high accuracy, it’s the perfect match for precision assembly tasks—and its rugged hardware is great in dirty industrial environments. Best of all, there’s no need for an external cable with UR’s new e-Series. Robotiq’s Adaptive Grippers can accomplish many different tasks with a fast time-to-production. Call us at 800-214-0322 for more information on our Robotiq solutions.